IMAGE: Director Rajkumar Hirani, left, with Ranbir Kapoor on the sets of Sanju. Rajkumar Hirani's office in suburban Mumbai is unique. The humour that we see in his movies finds its way here as well. There's a sign on the door, which reads, 'Bell not working please yell ding dong'. Charlie Chaplin hangs from a door. Chaplin movies play on a loop (I watched three films as I waited for five hours). In the lobby, underwear and the transistor from PK hangs on a display board. There is also the bike from Munnabhai MBBS and the unique seats from 3 Idiots. In the loo, there are pictures of 3 Idiots's R Madhavan and Sharman Joshi doing the 'Jahanpanah tohfa qubool karo' move. "No biopic will ever tell you the complete story," says Raju Hirani as Patcy N/Rediff.com listens in. The first of a two-part interview. How different is your approach when you make a biopic and fiction? When you are doing fiction, you are in total control. If you don't like a scene or if the climax does not work, you can change it because it is a fictional character. You can make him do whatever you want. But with a biopic, the responsibility is to stay true to the story. You cannot really change anything. The battle is how to structure it, and compress it. Kissi ki 50 saal ki zindagi aapko dhai ghante main dikhani hai (you have to show 50 years of a person's life in two-and-a-half hours). So you have to make your choices -- what is necessary for the film and what is not. 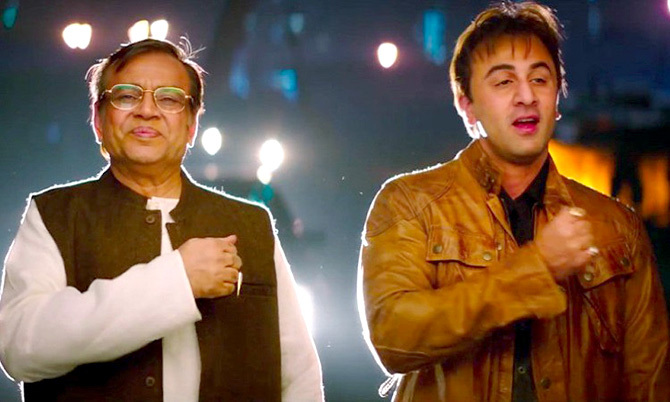 There are so many interesting things in Sanju's life, but we had to leave out many. Your films are entertaining, with a touch of comedy and a message. How will you fit Sanju in that template? I don't think the same template should be applied to all films. If I keep doing the same films that I have done before, it will get boring. When you do a film on religion, it's very different from 3 Idiots. 3 Idiots is very different from Munnabhai. I try to make different films. I do not consciously try to give a message. What I strongly believe in comes out in my films. What attracted me to Sanju's story was that we had not done something like this before. It was unique. Is this your darkest film? No, it is not dark. Every film can be told in various ways. What attracted me in this film was the father-son story and the friendship story. If the director liked thrillers, he would choose the dark side of Sanju. Having said that, all those things are also there in this film. IMAGE: Vicky Kaushal plays Sanjay Dutt's best friend in the film. Did you find it risky to make a film on Sanjay Dutt? In hindsight, you can look at my earlier films and say those were not risky. But when I was making Lage Raho Munna Bhai, everyone who heard the script told me I was mad -- Mahatma Gandhi is called Father of the Nation. How can you show Sanjay Dutt and Arshad Warsi drinking in front of him? How can you use the word 'Gandhigiri'? How can you change dadagiri to Gandhigiri? That seemed riskier than this. When we made PK, they asked how can you say all this about religion? 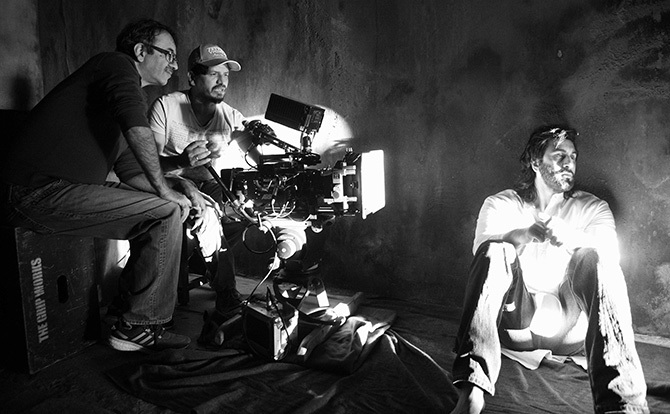 Every film may seem risky to some people but I don't think you get scared while making it. You are so enamoured by the story that you want to say it. Because he is alive, people will compare and some form of criticism will follow. Is this film giving Sanjay Dutt an image makeover? After watching the trailer, do you think it is about an image makeover? Which man will confess that he had 308 girlfriends and that he had been with prostitutes? I don't need to make a propaganda film for anyone, least of all, Sanjay Dutt. If I was an out-of-work director, maybe I would agree to something like that, but I was writing Munnabhai. I dropped that to make this. Munnabhai would have probably got a bigger response; people have seen it and liked it. 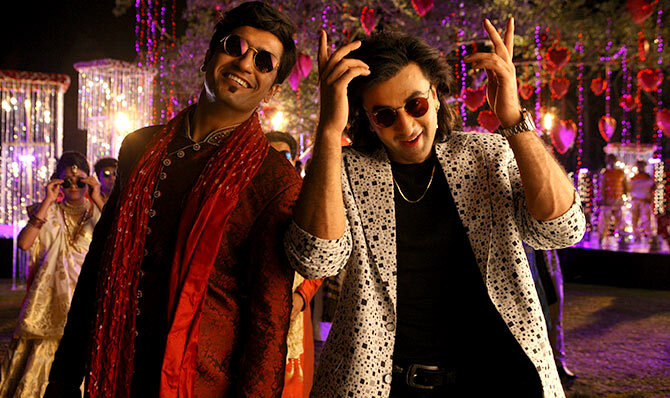 Why will I ruin my image to make Sanju's better? I found this script attractive because Sanju was willing to tell his honest story. IMAGE: Dia Mirza plays Dutt's wife, Maanayata. Initially, when Sanjay Dutt's wife Manayata approached you to make the film, you were apprehensive. That's because I had not heard the story from Sanju's mouth until then. When she told me to make this film, I said no because my perception was the same like the entire film industry -- that it is a dark story and not my territory at all. I don't like making stories about guns and drugs. They don't interest me. When Sanju came out on parole, I went to meet him. I was curious to know what it is like living in a jail -- what kind of cell was it, what does he eat, what does he do the whole day? So he told me about all that, and it was very fascinating. But it wasn't film material. The next day I met him again. He was lonely and started venting out. I started going to his house regularly. I would go at 5 pm and stay till 2 am. One day, he opened up. I have worked with Sanju but I cannot say he is my friend. We share a cordial relationship. I did not hang out with him like his other friends did, like Sanjay Gupta and Mahesh Manjrekar. So I never knew those stories. When I heard them, I thought kya aisa bhi life ho sakta hai? It completely sucked me in. Did you verify the stories? Yes. First, I heard his side for 25 days. A lot of it seemed unbelievable, so we started cross-checking. Before we even thought about making this film, we thought about legally checking it out. We met with (former Mumbai police commissioner) Rakesh Maria; he was the one who had caught him. Then, we met a couple of lawyers. We went through his chargesheet and judgment. We must have met 40, 50 people before we said yes to making the film. You said you left out parts of Sanjay Dutt's life. Will we see a sequel? No. Somebody else can make a film on those parts; there is a lot of material in his life. Making one film is exhausting and then, you want to move on. Even though I am doing Munnabhai again, I am not making the same story. I am using the same character and writing another story. Will we miss the parts you left out? How can you show someone's entire life in two-and-a-half hours? My favourite biopic is Gandhi. In that, his family life is not discussed at all. The turmoil in his family life was made in another film by another director called Gandhi, My Father. There are so many plays on the topic, like Gandhi Virrudh Gandhi, which shows his conflict with his son, and how his son became an alcoholic and blamed his father. Now just imagine if Gandhi had shown this conflict too, it would have been a mess! So you have to choose what is relevant to your story. For me, in Sanju's story, the most relevant things were his drug phase. At 21, when he was shooting for Rocky, he was totally into drugs. When his mother died three days before the premiere, he was not in his senses. The second interesting story is that he kept the gun and fought a court case for 25 years to redeem himself. Without these stories, there is no biopic in his life. If I add his affairs with his heroines, they are not relevant. So you will get a feel of that, but not in-depth. No biopic will ever tell you the complete story. They will tell the relevant parts of somebody's life, unless you are doing a series. But will that be engaging? No, it will get boring. IMAGE: Paresh Rawal plays Sunil Dutt. What made you cast Paresh Rawal? If you are doing a biopic of a person who is not so much in the limelight, it is easy. Like, when Bhaag Milkha Bhaag was made, Milkha Singh was not seen that much. So even if the looks did not match, it is okay. But Sanju is visible everywhere. There are millions of his photographs floating around. You see his films till date. So the battle was to find actors who matched the look. With Ranbir, fortunately, we could manage that. We thought a lot about who we should cast as Sunil Dutt but could not come to a conclusion. We did look tests, but none of them matched. But if you see Duttsaab's photographs, you will see he always had black hair -- he was probably dyeing it -- and he was clean shaven. So our hands were tied. There was a time when we were so frustrated that we thought the closest match to Sunil Dutt was Sanjay Dutt. We even thought of casting him but then decided it would be stupid to do that. We thought let us forget the look and let us get a fine actor instead. Sanjay Dutt's elder daughter Trishala is old enough and knows his story. Will his young twins, Shahraan and Iqra, be able to watch their father's story? I don't know. That is Sanju and Maanayata's call. Once Sanju had told me that when he was going to jail -- his kids were just two-and-a-half years old -- he had told them that was going for a shoot in the mountains and so his phone would be cut off and he would not be able to talk. It was difficult for him to deal with that.